These are bird strikes, sparrows to be precise. That’s the way it is, guys. Kevin Costner’s desire to return to the era that proved so fruitful nearly a decade earlier with JFK was understandable, and the Cuban Missile Crisis is a subject replete with so many opportunities for drama and tension that it would take some very clumsy hands to mess it up. It’s ironic, then, that the least effective aspect of the film is Costner himself. Which is not to say that he gives a poor performance. This is a typical Costner role, one that echoes the courageous family man type audiences have already seen several times (in the likes of The Untouchables and JFK). Admittedly, the star was widely taken to task for his dodgy Boston accent but I can’t say it particularly distracted me (aside from Costner occasionally looking as if he is chewing marbles). The real problem is really that his character, Special Assistant to the President Kenny O’Donnell is uncomfortably shoehorned into a central role. 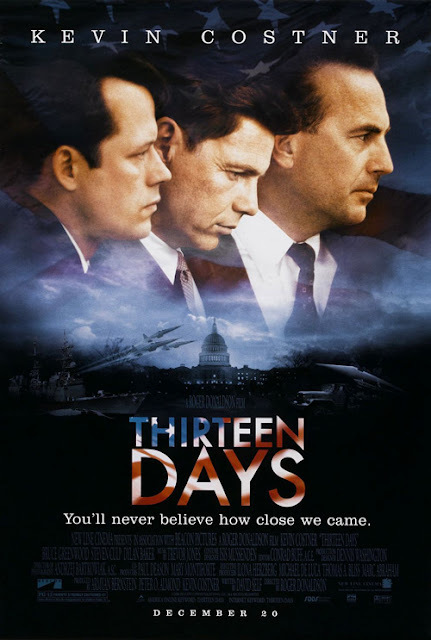 During intensive discussions between JFK and Bobby Kennedy (marvellously played by Bruce Greenwood and Steven Culp respectively), debating the best course of action to take, it frequently appears that there’s this eavesdropper present who is getting far more attention and input than he would warrant. Using O’Donnell as an audience surrogate is understandable, and there are times when Costner blends into the background, but it’s a problem that his he is the recognisable star trying to wrestle attention from the two character actors who are the real centre of attention and decision making. We shouldn’t be waiting on what O’Donnell says next, but the film’s point of view asks us to do that. Costner reunites with the above-average journeyman director Roger Donaldson; they had worked together thirteen years earlier on the excellent political thriller No Way Out. Donaldson’s approach is an unshowy one, concentrating on the character and story rather than visual flourish. Notably his one flashy choice here doesn’t work very well; dipping into black and white for “on the record” moments. It looks like someone has turned the colour down on an impulse, rather than adding a sense of period authenticity. The special effects aren’t so special either, with the CGI planes never looking very real. Where the film succeeds is fortunately in the most important aspect; the creation of a palpable sense of fear and escalation. Every time it appears that progress has been made, something else occurs to set back efforts. The impetus from the Joint Chiefs of Staff is to strike punitively first, most likely leading to war, with only the Kennedys there to hold back the tide; JFK is viewed by them as being weak, but rightly he has no stomach for a nuclear conflict. In a highly effective tirade against an ignorant naval commander, Dylan Baker’s Robert McNamara explains that the manoeuvring the President is engaged in is a whole new language that the military are either willfully blind to or are too ignorant to understand. At each stage there is opposition from some quarter, be it setting up a blockade rather than striking Cuba, unsanctioned activities that could be seen as provocative (nuclear and missile testing, sending a U2 into Soviet airspace, elevating the threat level to Defcon 2, firing flares as a warning to a tanker that has run the blockade), the concern over Khrushchev’s second message and whether it means the deal offered in the first is voided, the instructions to pilots that they are not to be shot down (and not to report any firing upon their planes). When a plane is destroyed by a missile events have reached the point where something like this was inevitable; the only surprising part is that the crisis did not spiral into all-out war. If there’s a problem with the depiction here, it’s that the lines being drawn are a little too black-and-white. JFK virtually has a halo permanently fixed over his head, so beatific is he. The filmmakers avoid any mention of Operation Moongoose (the US’s campaign designed to topple Castro, which likely fuelled the decision to place Soviet nuclear missiles there), which was coordinated by RFK. JFK agonises over his every move as if he resides on a higher plane of moral conscience than everyone else. Adlai Stevenson (a superb turn from Michael Fairman) redeems himself from being written off as a Soviet appeaser (he suggested offering the withdrawal of US missiles in Turkey in exchange for the removal of the threat from Cuba) when he takes the hardline with a Soviet representative at a crucial meeting; but he is there basically to show that the President was taking a shrewd middle-line and did have a pair of balls. It’s also unfortunate that the dialogue is at times rather literal-minded. That it doesn’t seem more so is down to the talents of Culp and Greenwood. The pep talks given by O’Donnell occasionally border on the trite (his car journey with RFK towards the end of the film is particularly guilty of this) and a growing tendency towards sentimentalisation threatens to scupper the earlier good work during the final stages. Kevin breaks down and cries on the stairs, and caps it off with a facile family breakfast conversation. David Self’s career as a screenwriter has been fairly patchy (work includes the remakes of The Haunting, The Wolfman and Robocop) so perhaps we’re fortunate that he steers the narrative so firmly for the most part. Despite its flaws, this remains a smart political thriller with an impeccable supporting cast.